Sorry it’s been kind of quiet around here in the Food section of the ol’ blog. Summertime is not one of my favorite times of year to do a lot of actual cooking. We tend to eat a lot of grilled meats and thrown-together salads and avoid turning the oven on. So, while it’s delicious and nutritious, it’s not exactly fare that I’m excited about creating recipes for. However! Never fear. Sometimes I actually remember that I both enjoy and am pretty good at cooking and I wander back into the kitchen. So here you go! Raise your hand if you like super easy, economical recipes that your kids will devour!!! Yeah, I thought so! This is a recipe that my mom found in a magazine (not sure which one) several years ago (not sure how long). Over time, I’ve taken it upon myself to add a bit, change a bit, and generally adjust it according to my family’s taste. I call it “Deep Dish Pizza-ish” because, for years, my youngest children would argue that I told them we were having pizza when clearly this was not pizza. Hey, you can’t please all the people all the time, amiright? 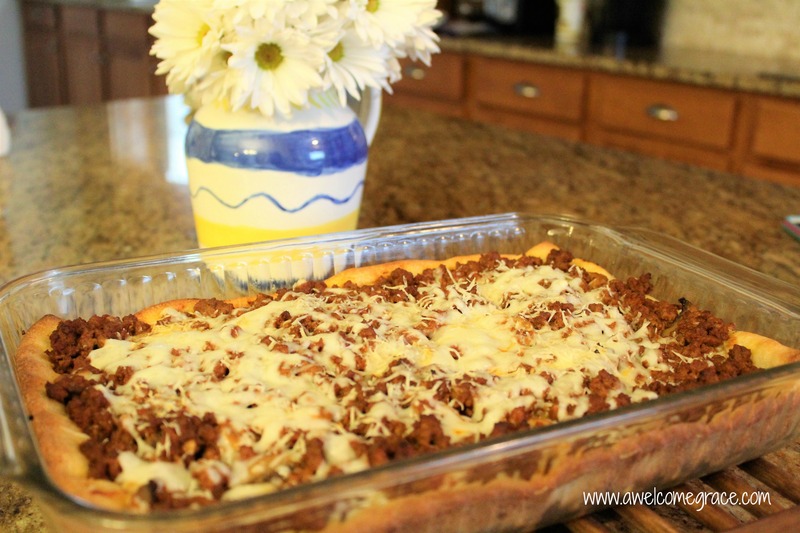 No matter what you call it, this recipe makes a wonderful weeknight meal and I know we all need that with the start of school looming on the horizon. It only has 4 (yes 4!) essential ingredients. 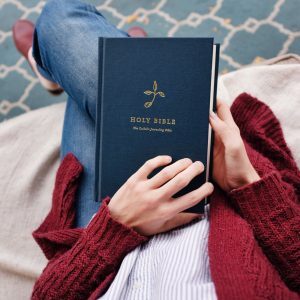 Everything else is icing on the proverbial cake. Most of these ingredients (even the extra ones) are things I have on hand any time of the year. I can have it in the oven with about 12 minutes of prep time. My kids are big fans. And anytime I can make a meal that everyone enjoys, that makes me a happy mama. Asterisks denote the essential ingredients. You really could make a decent version of this with only those four! First, preheat your oven to 400-degrees. Then, in a large skillet, brown the ground beef over medium high heat. Drain, if necessary. 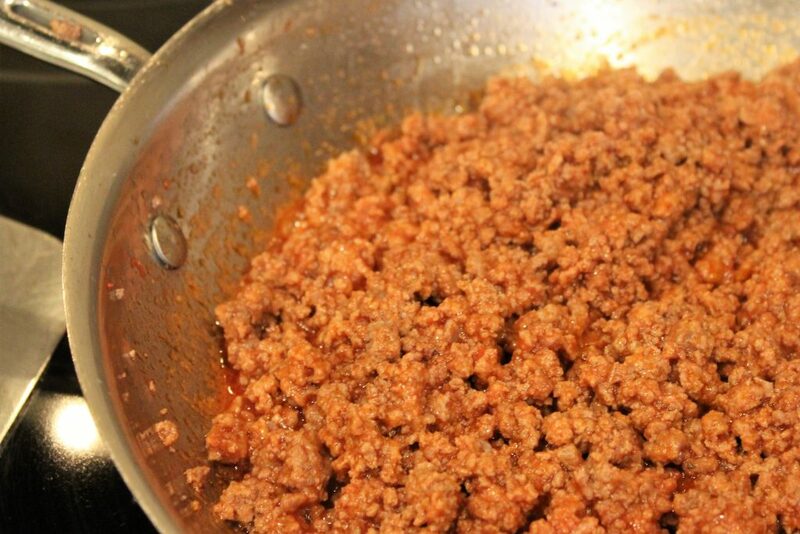 Then add in the tomato paste and stir while it melts into the meat. Add in the tomato sauce, any seasonings (and the canned mushrooms, if that’s your thing). Stir to combine. 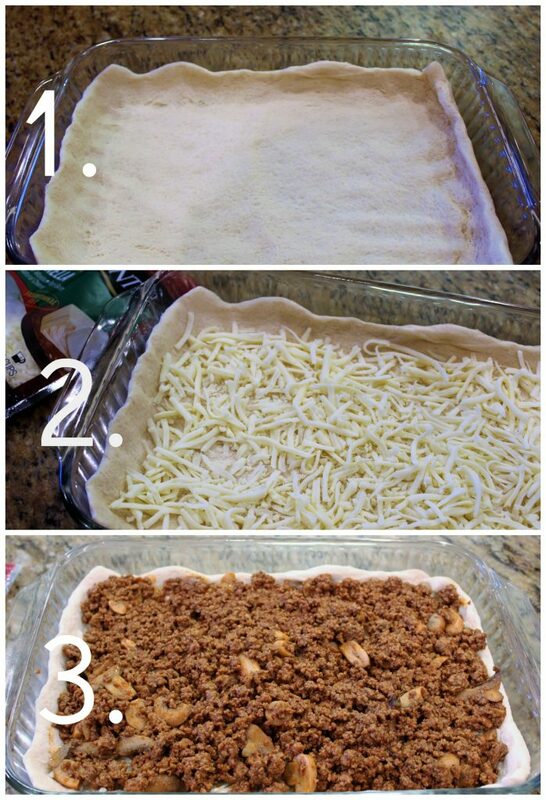 Next, unroll the refrigerated pizza crust and press into the bottom and sides of a 9×13 baking dish. 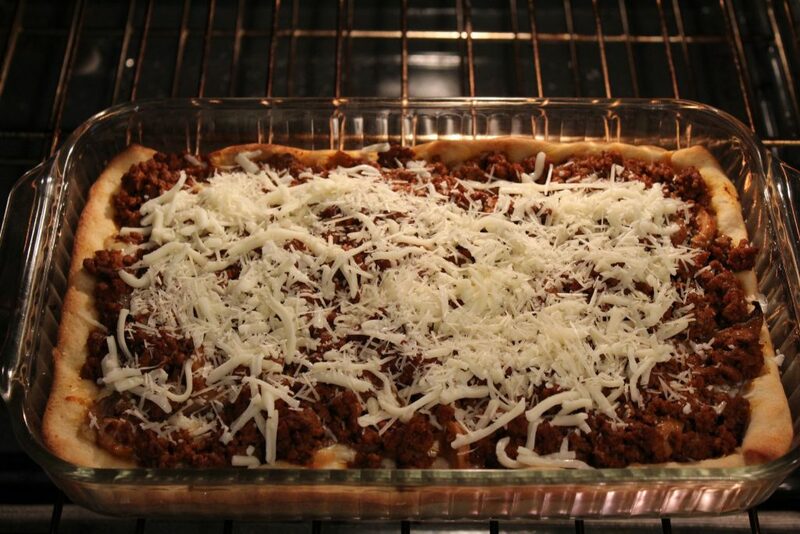 Cover the bottom with about 1.5 cups of the shredded mozzarella. Then, top that with your meat mixture. Pop it into your preheated oven for about 15-20 minutes until the crust on the sides begins to lightly brown. Then, open the oven and add the remaining mozzarella and the grated Parmesan. Bake for an additional 10 minutes or so until the cheese has melted. Remove from the oven and cool on the counter for about 5 minutes (just long enough to nuke a can of green beans or toss a quick salad) before serving it up. Be prepared for happy kids.